I was curious to give a look at the code and test PlatformIO. That let me think that for some reason PlatformIO is not recognizing some of the build flag directives? First tip: try putting the separate flags on their own lines. There was something funky about the way Platformio parses the ini files. Try with both but same result. Start with a blank project and minimal main. Just to test platformIO has been installed correctly. It compile correctly. Back to @Pharap instructions to include the master branch but same results. src\main.cpp:57:1: error: 'constexpr' does not name a type; did you mean 'constrain'? src\main.cpp:58:1: error: 'constexpr' does not name a type; did you mean 'constrain'? Could you provide platformio.ini? What is your dev/platform//board? Can you check the c_cpp_properties.json? Are you using the platform.ini that I provided in the repo? Modify that entries by hand seems to have no effect. Also tried with pio init --ide=vscode but same. Can you post your platform.ini somewhere? E.g. in a gist? I just downloaded a fresh copy of the repo and set up a blank project and used the repo files to overwrite the project files. It worked seamlessly for me. The only way I can get my copy to do that is by deleting the -std=c++11 from platform.ini. Have you tried nuking the PokittoLib and reinstalling it? I’m using usb-portable version of VsCode. Going to full install standard version. 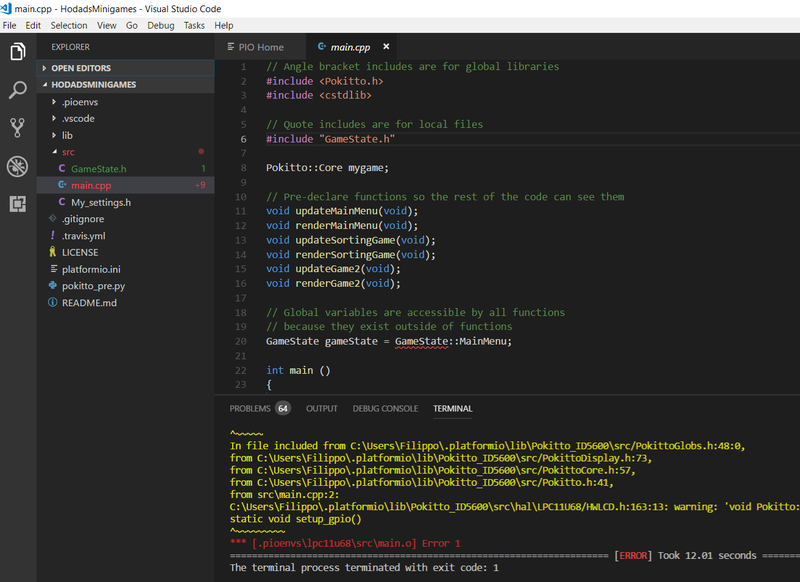 Installed standard VS code , reinstalled PlatformIO and PokittoLib. Started from a C working solution single minimal main.c. Add -std=c++11 to platformio.ini. Close and reopen VSCode. Make sure it’s main.cpp and not main.c, if you try to use .c anywhere the compiler will go into C mode and won’t recognise constexpr anyway. Just a typo. It’s cpp. and that’s made the trick. Thanks for help.